WE ARE WRITING REGARDING THE EMINENT EVICTION OF BEVERLY AND MATTHEW MURRAY OF COLDWATER, MICHIGAN, LOAN # 23723976, WHICH WILL BE CONDUCTED THIS WEEK UNLESS BANK OF AMERICA STOPS PLAYING GAMES WITH THEIR LIVES AND ORDERS IT STOPPED!!! Bank of America and its employees are involved in a deliberate attempt to defraud Beverly and Matthew Murray of their home. The Murrays have been contacted by several employees from the Office of the President and CEO offering help to complete a FAIR modification, but when they call, they are told BoA cannot work with them because their case is in litigation. This is a stonewalling tactic. Both the courts and the Murrays attorney verify their case is no longer in litigation. Faith Quist and Cindy Mahan (from the office of the President and CEO) have intimated to the Murrays there is an open case for modification on this. In fact, Faith Quist reopened a new one as well. However, your counsel, Bill Asimakis, has incorrectly represented in an email to the Murrays’ attorney that there is no open case. This is deception. The Murrays have meticulously kept documents, which demonstrate that Bridgette Grier and many other BoA employees, after advising the Murrays to contact them, have refused to speak with them on this matter. The Murrays have also repeatedly reached out to you Ms. Wagner. You have been unwilling to assist them. BANK OF AMERICA IS DELIBERATELY DEFRAUDING THE MURRAYS OF THEIR HOME. The Murrays have paid nearly 43K in escrow payments over a two year period, demonstrating that, had you provided them a fair modification, they could have easily afforded to remain in their home. WE DEMAND THE MURRAYS’ EVICTION BE HALTED AND THAT THEY BE GIVEN A FAIR MODIFICATION!!! 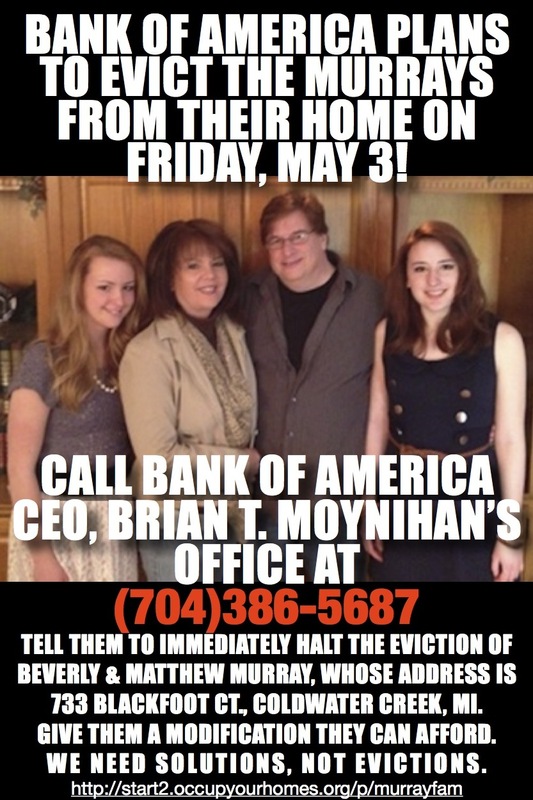 Should you continue with the Murray eviction, we will not rest until Bank Of America and its employees are exposed for these atrocities against homeowners. Hello Ms. Wagner. I am (your name), calling from (city, state). We are calling with regards to Beverly and Matthew Murray in Coldwater, Michigan. Their loan number is: #23723976. They are scheduled for eviction due to a wrongful foreclosure for this week. They have paid $43,000 into escrow payments in a two-year period. The have ask you repeatedly for help you and you ignored them. We demand you stop playing games with the Murrays and halt their eviction, as well as provide them a fair modification. #3 Print the LETTER OF DEMAND TO BANK OF AMERICA and sign it. Place it in an envelope and go to your nearest Bank Of America branch office. Ask to speak to the manager. Tell that you want justice for the Murray family in Coldwater Michigan and leave the letter with him. Thank you for helping in the fight for the Murrays’ home!